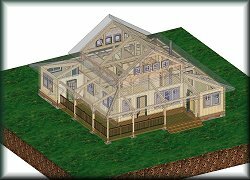 Timber Quest timberframe design and construction. View from our 3D cad program. Timber Quest LLC. offers a unique aspect to the design phase. We do everything in 3D. What does this mean to the customer? That's simple, you get to see the finished product before you ever actually build it. This allows us to foresee any problems before we ever build the building, cutting down on costly field errors. 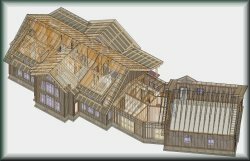 The 3D drawings not only help you, but they help anybody in the building process. I have noticed that contractors at times have problems visualizing the finished product with the traditional 2D drawings, which in turn causes numerous hours studying the prints. With our drawings the contractor is able to see exactly what needs to be done, this saves the contractor valuable time which in turn saves you money. Not only can we give you 3D drawing; we can do 3D rendering. This view is close to that of an actual picture. This process helps greatly for visualization. Another benefit of our 3D program is that we are able to produce material lists. After we have completed a drawing, we are able to number every piece of material in the building. Automatically all material of the same kind and size receives the same number. After we have numbered the drawing, we are able to make out a material list. 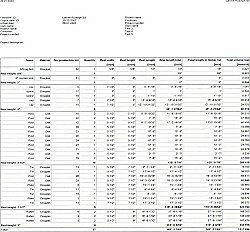 It takes each numbered material and gives you the name, quantity, material, height, width, length, bdft, subtotals, and totals of all materials. We can change the list to a wide variety of listings, the above are just a few of the common items we like to use on our lists. With this complete material list we can order a correct amount of material and have very little waste. This will save you money. Making these lists only takes a few minutes after the building design is complete. If we had to make the same list by hand, it would take several hours. Our design capabilities are not limited to just blue prints, if you have small problems, such as figuring out a stair layout, we will be more than willing to accomodate you. We can also do complicated roof systems in 3D. We can produce a roof system very quickly and 100% accurate. Hips and valleys are no problem. All we do is put in the basic floor plan and the different roof pitches. The program will do the rest. If you're the do-it-yourself kind, we can work off of your floor plans to produce a 3D drawing. We are easy to work with and our motivation is to fulfill your dreams. You will be happy that you chose Timber Quest LLC.